[%pageBreakSettings nobreak=true] One question that invariably comes up when I talk about chocolate is how best to store it. The glib answer is, the best place to store chocolate is in your mouth. The larger issues around chocolate storage are really cultural, I find. In chocolate-loving European countries, the idea never comes up, as the approach to food in general and foods such as chocolate in particular is very different from ours here in the U.S. In Paris, for example, I noticed that people don't have large apartments or even large refrigerators. So there's a tendency to buy food in small quantities and to buy it often. If chocolate is part of the menu, you stop by the chocolate shop on your way home, and you pick up only what you need for that night. Here, the tendency is to buy a large box, far more than can be eaten at one time. So we are faced with the challenge of figuring out what to do with the leftovers. Our first impulse is to refrigerate them. There's nothing inherently wrong with refrigeration, but it should be considered a last resort, not a first choice. The first choice is to buy chocolate fresh and eat it right away. Where you buy chocolate is important. When you want to buy the best cheese, you don't go to the convenience store; you go to a specialty cheese shop or gourmet store. You won't find the best chocolate in your local drugstore; you'll find it in a specialty or gourmet store. Ideally, the relationship you want to forge with your chocolatier is the relationship your grandmother wanted to have with her butcher: trust. You want to be able to walk into your chocolatier and say, "What's good today?" and get great recommendations. That box of chocolate in the drugstore is probably at least six months old before it even makes it into the store. 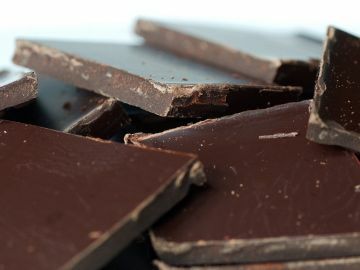 If you can't eat the chocolate right away, for whatever reasons, the best way to store it is at room temperature (66 to 72 degrees F), at as constant a temperature as possible, in a dark place, and away from strong odors. Rapid swings in temperature, exposure to bright light (i.e., the sun), storing it above the kitty litter box, and extended storage above 76 degrees should be avoided. If stored with these minimal precautions, even very high quality confections will last at least a week or two. Dark chocolate bars should last a year or more, and milk chocolate bars six months or more. Hopefully you're not buying chocolate in such large quantities that you need to store it for this long. If you find that you must store chocolate for longer periods of time, the enemies that must be thwarted are humidity and odor. I have found that the best place to store chocolate is in a wine fridge or wine cellar that also controls humidity. You can significantly extend the shelf life of your chocolates by keeping them at the same environmental conditions you would keep red wine. When stored in a wine cellar at red-wine conditions, you can confidently count on doubling the life of most confections. However, it's important to let the chocolate stand at room temperature for several hours to warm up before you open the box. It's cooling down and warming up that raises the most risks when storing chocolate. At no point do you want moisture to condense on the chocolate, and that can easily happen if there is a difference in humidity between the room and where you're storing the chocolate. Moisture condensing on chocolate can cause sugar "bloom" (sugar crystals forming on the outside of the chocolate), which permanently ruins its texture. If you are storing chocolate in a refrigerator or freezer, you also have to worry about the chocolate picking up odors from other items stored nearby. # Before storing, divide up the chocolate into individual portions. # Wrap each portion in its own plastic bag and loosely cover with something moisture-absorbent. A piece of unbleached paper towel or napkin works. Remove as much air as you can without squishing the chocolates. # Put the portions into the refrigerator. # After 15 minutes, look to see if there is any moisture on the inside of the bag. If there is, replace the moisture-absorbent material and use a new bag. # Put the individual portions into freezer-weight bags to protect them from odors. Double-bagging is recommended, as is putting paper towels in the freezer bags to absorb minute amounts of moisture (to prevent freezer burn). At this point you can keep them in the fridge for three months or so, or pop them in the freezer for up to a year. If you are storing chocolate in the freezer, remove only the portions you need and put them into the refrigerator for at least 8 to 12 hours to warm them up to fridge temperature. From the refrigerator, take portions and put them in a dark place (a cupboard will do) to come to room temp, at least an hour or two before opening up the bag. p(blue). Editor's note: Congratulations to Cynthia and Brooke who both won a copy of Clay's book and some Moonstruck chocolates for having their entries drawn from the comments made before Dec 18, 2007 -- Enjoy, and tells us how you like the chocolate.